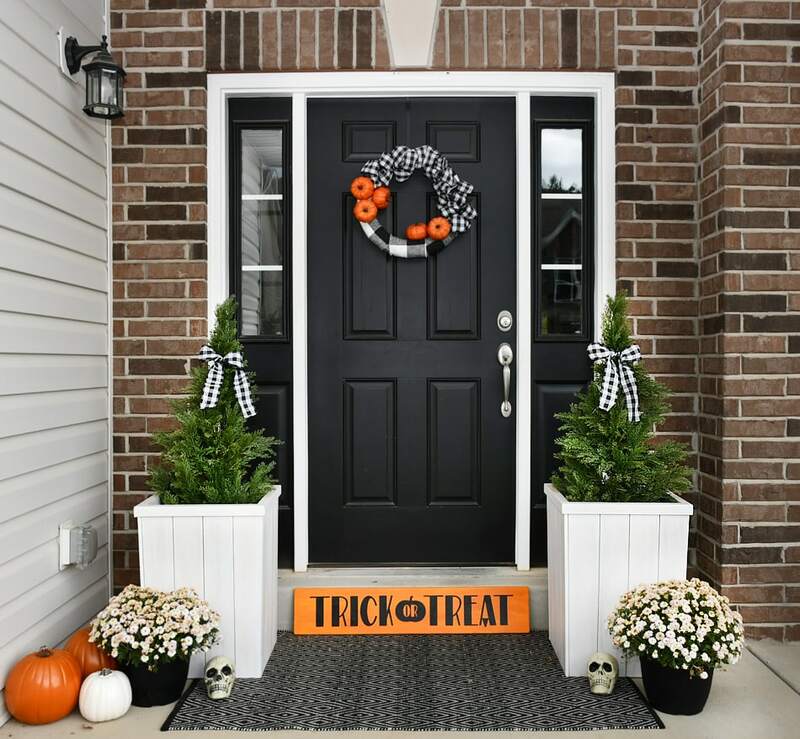 If you’re looking for Halloween front porch ideas, I showed you guys my Fall front porch a couple weeks ago and I’m still totally smitten with the buffalo check and pumpkin design. It’s perfectly fitting for the Halloween season with black, white, and orange colors. 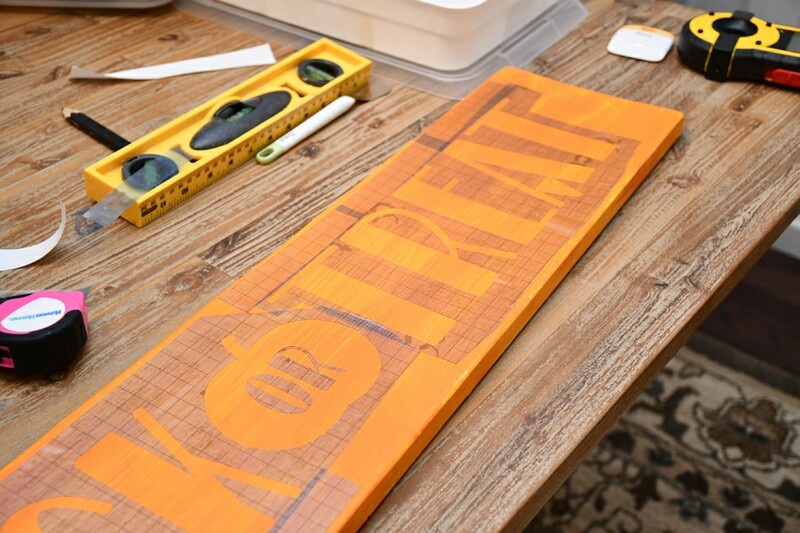 I didn’t have to change it up too much for October, but I did want to add one little element to it… a Trick or Treat Wood Sign! 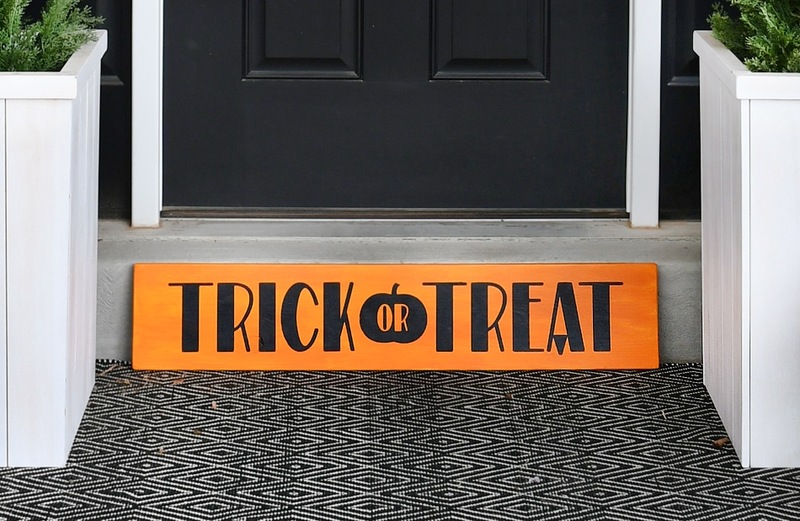 I first thought about putting this sign in my family room and switching up our fireplace mantel for Halloween, but then I realized it was the exact same height as our front step. Perfect little addition to welcome the neighbor kids this year! I just started with a 1×8 board that was cut to 36.5 x 7.25 (keep in mind 1×8 boards are actually 7.25 inches wide when you buy them). I painted the board with orange acrylic paint. Now I have a covered front porch so I’m not worried about the board getting wet from rain. If you don’t have a covered front porch, I would suggest using spray paint (or just add a sealer over the paint… or keep your sign indoors!). 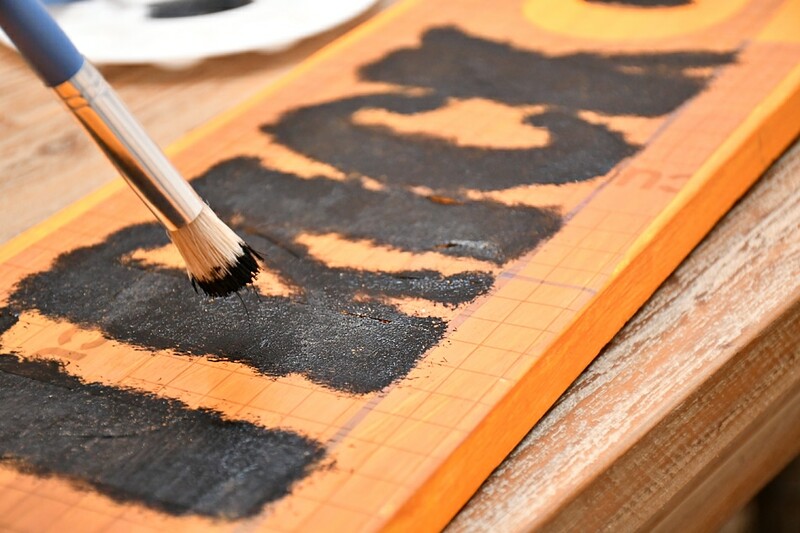 For the trick or treat wood sign design, I just laid out a cool font in Photoshop and saved it as a JPG. Then I imported it into Cricut to cut out. If you want to use the same design, just right click on the image below to save it to your desktop, or click here. I have a 24 inch Cricut mat but I still had to do my design in two pieces. It’s so nerve-wracking putting the two pieces back together… even with the grid on the stencil vinyl. I’m hoping practice will make perfect and this whole part will come easily after awhile! After the stencil was in place, I just used a bit of black acrylic paint and a stencil brush. I let it dry for just a few minutes and then peeled off the stencil vinyl. To stick the trick or treat wood sign in place, I just used a Command Brand strip. Super easy. I also added two little skeleton skulls I bought from the Dollar Store over the weekend. I haven’t been there in awhile… holy moly. That is Halloween central. I was shocked at how much I could get from there for $18, when I easily would have spend $85 at Hobby Lobby or Michaels. Definitely shopping there more often! Thank you Cindy! Blessings to you! I like it, and what inventive placement for the sign. Good thinking!